The Camoran Dynasty was an aristocratic dynasty that ruled Valenwood for much of its history. One of the earliest known dynasties in Tamriel, its founding by King Eplear is an event traditionally regarded as the beginning of Year Zero of the First Era. Eplear's success in uniting the inherently wild Bosmer has been argued to be one of the greatest military feats in Tamriel's history. The Camorans remained in power for centuries afterwards, even resisting the aggressive expansion of the Alessian Empire, until Valenwood was conquered by the Second Empire in 1E 2714 following years of unrelenting warfare and the devastation of the Thrassian Plague. The Camoran Dynasty survived, but the Empire broke its influence by granting independence to Valenwood's lesser nobles. When the Second Empire fell in 2E 430, the Camorans unsuccessfully attempted to reestablish their reign, but Valenwood's territories had drifted too far apart culturally to be united and the region descended into conflict. 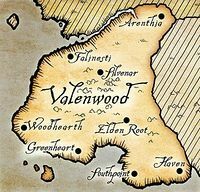 Valenwood would briefly achieve unity under Camoran rule only twice during the Interregnum, and then only as a member of the first and second Aldmeri Dominions. At the time of the first Aldmeri Dominion in the Sixth Century of the Second Era, Aeradan Camoran was crowned king and joined the Dominion to defend his realm against encroaching Colovians in the north. A dispute over the succession between the Camoran heirs in 2E 830 led to the intervention of the Altmer and the crowning of Camoran Anaxemes, who pledged fealty to the king of Alinor and thereby ushered in the second Dominion. Anaxemes was then forced to cede much of his power to the Thalmor, a congress of Bosmeri chieftans and Altmeri diplomats who proved modestly effective until Tiber Septim swept them away. Under the Third Empire, the Camorans retained the throne of Valenwood as figurehead monarchs. The year 3E 249 saw another dispute arise over the Camoran succession, a dispute which soon escalated into a massive war that threatened the whole of the Empire. One claimant to the throne, Camoran Kaltos, conquered most of Valenwood in two years with the aid of Haymon Camoran, also called Haymon Hart-King, another claimant and Kaltos's chief advisor and sorcerer. Against Kaltos's wishes, however, Haymon declared war on the people of Colovia and marched his armies north. Kaltos pleaded with Haymon to return to Valenwood, but Haymon betrayed him and claimed the Camoran throne for himself, thus becoming the Camoran Usurper. The Usurper's armies ravaged western Tamriel for nearly twenty years, driving through Hammerfell all the way to High Rock while Kaltos unsuccessfully fought to stop him. At last the Principality of Dwynnen marshaled the other city-states of High Rock and joined forces with Camoran Kaltos to defeat the Camoran Usurper at the Battle of Firewaves; Haymon Hart-King was killed in the battle. The Camoran Usurper reportedly fathered an illegitimate son named Mankar who was born just prior to his defeat. This son shared the same name as Mankar Camoran, an Altmer who led the Mythic Dawn cult, suggesting both are the same individual. This page was last modified on 9 November 2018, at 12:37.